Use the direction pad to move Link in the four cardinal directions. Once Link has obtained obtained the hammer, you can press the A button to wield it and smash down boulders that block your path on the roads. Once Link has collected the flute, press the B button to play a tune on the magical instrument. Press Start to pause and unpause the action mid-game. / / / / Direct Link to run to the left or to the right. Press down to make Link crouch. 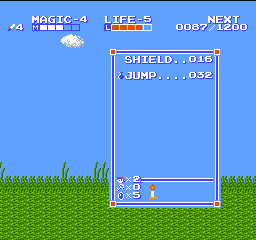 Doing this also moves Link's shield down so that you can block a lower attack. If you have the downward thrust move, pressing down while in mid-air will do a downward thrust attack. If you have the upward thrust move, pressing up while in mid-air will do an upward thrust attack. Press the A button to make Link jump. Press jump in conjunction with left and right to direct Link through the air. Press the B button to make Link slash out with his sword. If he is at full health, this will also send out a magic sword-blade which travels a short distance. Press Start to pause the game and call up the Sub-Screen. / Once you have selected a spell from the subscreen, press this button to cast it, provided you have enough magic. Before you begin, you must first enter your name in one of the three save slots. Press / until the fairy is next to "REGISTER YOUR NAME" and press . Use the / button to line up the heart with the Link that you wish to name. Enter a name of up to eight letters using the control pad to select a letter and the button to enter it. Once you have registered your name, line up the heart with "REGISTER END" and press . Press / until the heart is next to "ELIMINATION MODE" and press . Use / to move the fairy next to the Link that you wish to erase and press the button. This will erase that name. Move the heart to "ELIMINATION END" and press again. This permanently erases all the data for the Link selected so use with caution. On the selection screen, you can select a saved game to continue. Certain information can be seen from the selection screen. 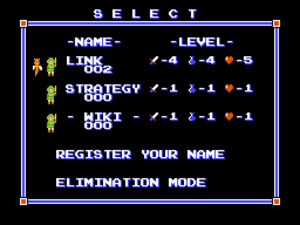 This information includes the save file's name, the current levels of Link's power, magic, and health, and the number of times Link has lost all of his lives for that save file. If there is a Triforce in the file, it means the save file in question is in the middle of the second quest. If you want to continue the game, choose "CONTINUE" with the / button and press . You will begin the game in the North Palace alongside sleeping Princess Zelda with full health and magic, with all of your possessions intact, but your current experience points will be reset to zero. If you are done for the time being, choose "SAVE" with the / button and press . All information about your accomplishments will be stored and retained until the next time you play. Link's current magic level, and the current amount of magic power. Link's current health level, and the current amount of health remaining. Link's current experience points out of the amount needed for the next level. Which of the eight spells Link has learned, and how many point of magic it costs to cast them (one portion of the magic meter is 16 points). The number of lives that Link has remaining. The number of dungeon keys that Link currently possesses. The number of palace crystals that Link has left to place in statues. Link's current inventory of items and equipment. 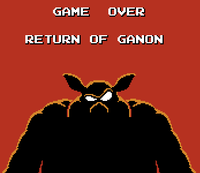 Link begins the game with 3 lives. Lives are lost when Link loses all of his health or falls into a pit. Lives can be gained by collecting link dolls which are scattered throughout the game. Losing a life can be beneficial because all of your health and magic will be replenished. There is a penalty to continuing the game after all lives have been lost. Upon death, Link will revive at the starting point of whichever location he is in. Dying while engaged in an overworld encounter will restart from the center location. Dying in a town or action segment will cause Link to enter the area from the same direction he originally came from. Dying in a palace will place Link at the entrance or most recently passed checkpoint. When this happens, any of the more threatening enemies you already defeated will remain out of the game. Other enemies will re-spawn. If you wish to fight all of the significant enemies again you may leave the palace, and then immediately reenter. There are a few one-up dolls scattered throughout the game. These will appear in action segments, and be placed on the ground to be picked up. These are very valuable if the player wishes to avoid using continues. Should Link lose all of his lives but still wish to continue his adventure, he may do so. When the game is continued, Link will start from the temple where Zelda sleeps. All items and levels Link acquired will be preserved, but he will lose all experience points towards the next level. His lives count will be reset to 3. This page was last edited on 14 March 2016, at 01:05.